When I visited New York City, I took several rolls of my favorite subject in that City - Central Park. It doesn't take one very long to discover that there is a veritable microcosm of humanity walking, sitting and sometimes living within the confines of this famous landmark. In many of my Central Park paintings, I have attempted to show the humanity one may find in this marvelous place. The titles of the paintings reflect the diversity of that humanity: "The Bird Lady", "The Sunshine Painter", and "The Rag Lady", etc. Now, looking again through my photos and sketches, I'm drawn to yet another scene in the park. A corner with a traffic signal, a bench, a fountain, people and vendors selling hot bagels from umbrella covered pushcarts. I sketch out different ideas, moving figures from left to right, foreground to background. "Now, how would a little boy with a balloon look?" Or, better yet, "how about that balloon stuck up in the limbs of a tree with the little boy forlornly sitting on a bench in left foreground? Or, "How about an elderly man reading a newspaper on that bench instead?" One idea after another, each sketch a little more clever than the last. Out goes the little boy, the balloon, the man reading the newspaper, the people, the vendors and the pushcarts! I now take fresh paper and begin anew - choosing the best photo of this scene. I first decide to change the time of day and the climate, so now it's early morning and it's cold and misty. I soften the background creating that “morning fog” look. 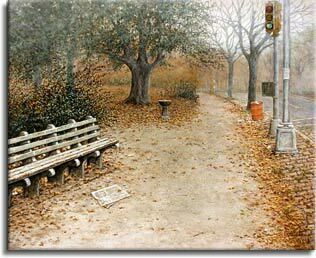 I delete all the figures and sketch in the bench, path, trees, traffic light, trash can, etc. - all the signs of man. Now, I must try to put back into the picture the essence of "man" without the actual figures. The feeling that "man" was here yesterday and will probably be back again today when the sun comes out. But, for now, the only person present is you, the viewer. I must succeed in inviting you to walk down that path into the scene. I add more trash spilling out of the can onto the ground, paper cup near light pole. I add another trash can and bench in the background for the sake of composition and, to bring the viewer a little further down the path. Also, a "lost" sign on pole – (more human interest). The fountain was situated in front of the large tree, so I moved it over to the right for better balance and contrast. And, last but not least, I put in the wind-blown page of a newspaper on the around in front of the bench. This seemed a good counter-balance visually as well as yet another sign of "Man's" existence. Although I employed my "artistic license" quite broadly throughout this painting using only the elements I thought were important, I feel the scene is an authentic rendering of a specific time and place. If you were to go to that particular end of the park, I would like to think you would still recognize it after seeing this painting.